Thank you for inviting me to this year's Social Enterprise Summit. I am no stranger here, for I attended this Summit in my previous capacity as the Chief Secretary for Administration in 2012 and 2013. I am naturally pleased to be able to join you again as this year marks the 10th anniversary of the Summit, and I am honoured to address you in my new capacity as the Chief Executive. That the Summit has reached this anniversary milestone is due largely to the enduring passion of the organisers behind this global gathering. Ten organisers were behind the first Summit. This year, 16 organisations are involved in bringing you together. While only 300 attended the first summit in 2008, some 4,000 social enterprise professionals, entrepreneurs and others committed to the power of "business for good" are expected to take part in this event this year. It shows that this Summit has grown significantly in scale, and has become an annual flagship event in the social enterprise sector. I wish to express my heartfelt thanks to the organisers for their tireless efforts and remarkable achievements. The "business for good" culture in social enterprise operation always keeps a close tab on the pulse of the community. The sustainable growth of the social enterprise sector can help promote social innovation and address the needs of socially disadvantaged groups. 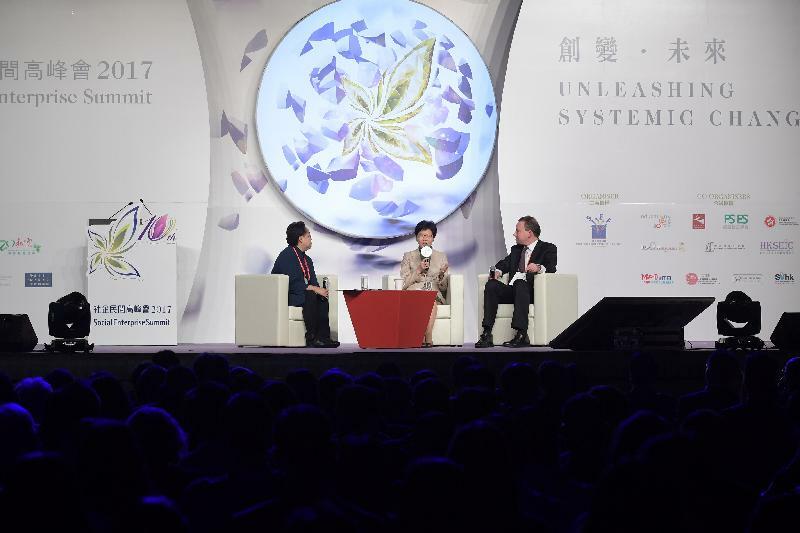 As the theme of this year's Summit, "Unleashing Systemic Change", reminds us, our social enterprises have always strived to provide solutions and pioneered to implement innovative projects to alleviate social problems through cross-sector collaboration. A prominent example in recent months is that some social enterprises have launched housing schemes in collaboration with property owners and non-profit organisations to provide flats at affordable rents for needy families living in meagre accommodation. These projects give an encouraging demonstration effect for cross-sector collaboration, in which different sectors work towards advancing social good through their joint efforts. From the beginning, Hong Kong's social enterprise sector has been community-driven, with the Government playing the supporting role. I have been around long enough to see the significant beginnings of government involvement in social enterprise. One of the first government programmes which provide funding support to social enterprise was implemented in 2001, when I was the Director of Social Welfare. The programme, which is still running up to this day, is called Enhancing Employment of People with Disabilities through Small Enterprise Project, "創業展才能計劃", or in short, 3E Project. It subsidises non-governmental organisations to set up small businesses, including social enterprises, that directly create employment opportunities for people with disabilities. 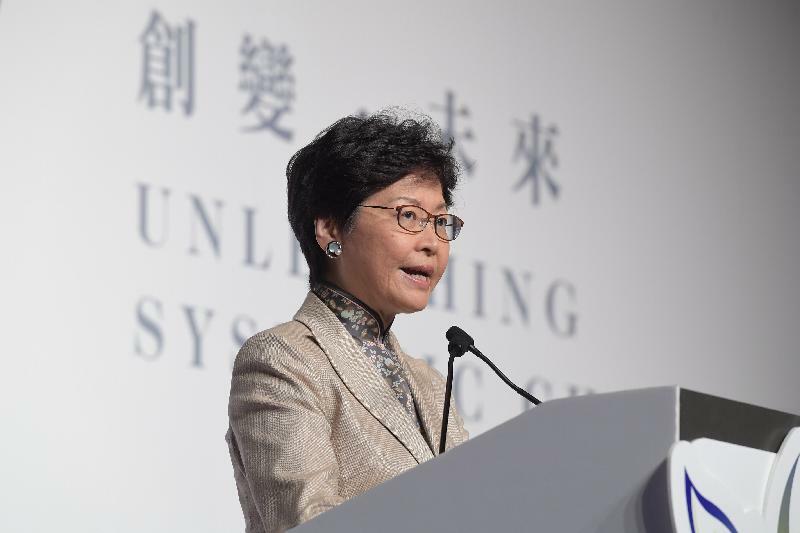 This year, the Government injects an additional funding of HK$100 million for the continued operation and expansion of the programme, and increases the maximum funding for each social enterprise from HK$2 million to HK$3 million. In 2006, as Permanent Secretary for Home Affairs, I helped initiate seed grants to non-governmental organisations setting up social enterprises through the Enhancing Self-Reliance through District Partnership Programme, or the ESR Programme. The Programme works to strengthen district-based poverty alleviation and assist socially disadvantaged groups in integrating into the community. Since its inception, the Programme has granted HK$260 million towards the establishment of 205 social enterprises, creating about 5,000 jobs. We would keep track of the operation of the enterprises for a few years after the end of the funding period, and what I find encouraging is that some 80 per cent of the social enterprises are still in operation after the funding period, showing that as long as we give them a little push at the beginning, many social enterprises can indeed be sustainable. My Government believes in the power of connectivity. We encourage people from all walks of life, especially the commercial sector, to strengthen co-operation with social enterprises and non-governmental organisations, and to support projects with social value. In this connection, we have already relaxed the eligibility criteria of the ESR Programme since last year to more broadly benefit social enterprises, while encouraging greater participation of the business sector in social enterprise development. Today there are about 600 social enterprises in Hong Kong. While that is more than double the total in 2008, it remains a modest presence in a city of over 7 million people. For a mature economy and an affluent society like Hong Kong, we should and we will set a much higher target for social development. To that end, we will take a multi-pronged approach. That includes funding the establishment and expansion of social enterprises and social innovation projects. We will continue to engage intermediaries to provide support to social entrepreneurs, engage partners in formulating and implementing collective impact initiatives, and promote the "creating shared value" concept in the business sector. In addition, the Social Innovation and Entrepreneurship Development Fund will implement new measures, which include providing support to start-up social entrepreneurs and ventures through partnership with industry players offering co-working space, and exploring new funding modes by making use of various financial vehicles, such as equity investment or loan guarantee, to meet different funding requirements of social entrepreneurs. We will also encourage public support for social enterprises through publicity and the promotion of cross-sectoral collaboration as well as social innovation. The tax measure I have announced in my Policy Address last month, namely to reduce profits tax on the first HK$2 million of profits from 16.5 per cent to 8.25 per cent will naturally also facilitate the growth of social enterprises. Speaking of innovation, I would like to thank Geoff for his address just now on public sector innovation, which has given me a lot of encouragement and food for thought. I have pledged to inject a new style of governance in my term, an important element of which is to be innovative in serving the public. For that purpose, I have announced in the Policy Address that I will revamp the Central Policy Unit as the Policy Innovation and Co-ordination Office. This new Office will directly report to me and will help tackle the difficulties that may be encountered in introducing new ways of thinking into the government system and in our search for breakthroughs to the status quo. As you may be aware, we are in the process of recruiting 20 to 30 young people aspiring to pursue a career in policy research and policy and project co-ordination to join this new Office. It will be mutually beneficial. The young people will have opportunities to interact and exchange views with me and other principal officials to gain a deeper understanding and practical experience in public policy. At the same time, they will bring us fresh ideas and suggestions, sort of thinking out of the box, which are essential for innovation. I have high hopes for this Office and am looking forward to working with these young people. As the positions are still open for application, if you know anyone who fits the bill and aspires to serve the public, please do encourage them to apply. Before I close, I thank the organisers once again for hosting this Summit, and I wish it every success. I look forward to working with you all in creating a better Hong Kong in the coming years.